Leading industry watchers like IDC and Gartner early this year predicted that the first quarter of 2016 would not be good for the PC industry and various companies agreed with that. The reasons for the declines are well known: global economic issues, the slowdown in China, the strong U.S. dollar as well as competition from smartphones and other devices. 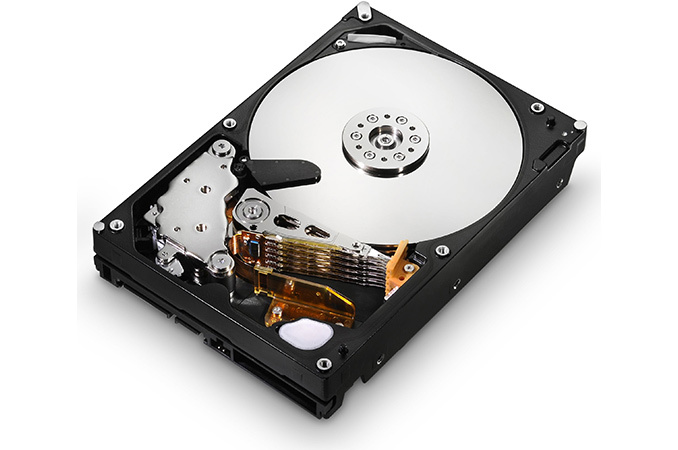 As sales of PCs were not strong as predicted, this negatively affected the hard drive market. According to Gartner, PC shipments worldwide totaled 64.8 million units in the first quarter of 2016, a decrease of 9.6% from Q1 2015. The company notes that this was the first time since 2007 that shipment volume fell below 65 million units. Analysts from IDC are even more pessimistic because based on their findings, shipments of PCs in the first quarter totaled 60.6 million units, a year-over-year (YoY) drop of 11.5%. As we noted in our previous coverage of the HDD market earlier this year, the decline of HDD shipments in 2015 significantly outpaced the regress of the PC market. 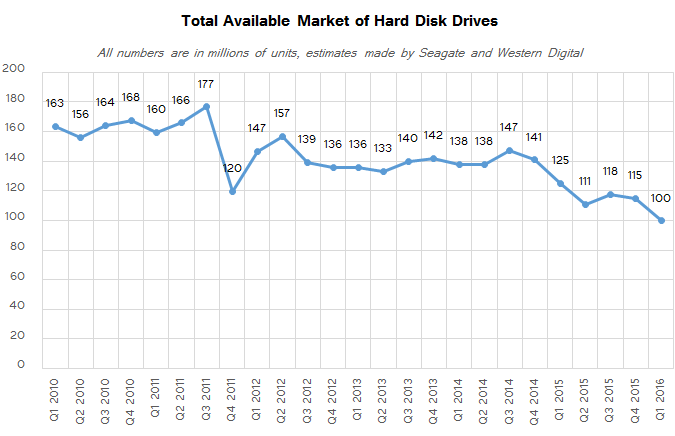 As it appears, the same happened in the first quarter of 2016 as the total available market of hard drives dropped to a new multi-year low. Seagate, Toshiba and Western Digital, the three remaining producers of HDDs, shipped a total of 99.8 million hard drives in Q1 2016, or 20% less than in the same period a year ago according to their estimates (see counting methodology below). According to estimates from Nidec, the company that sells the majority of small precision motors for HDDs (over 80% of them, based on its own estimates), the industry sold 98 million hard drives in Q1, but it is worth noting that Nidec is typically very conservative. 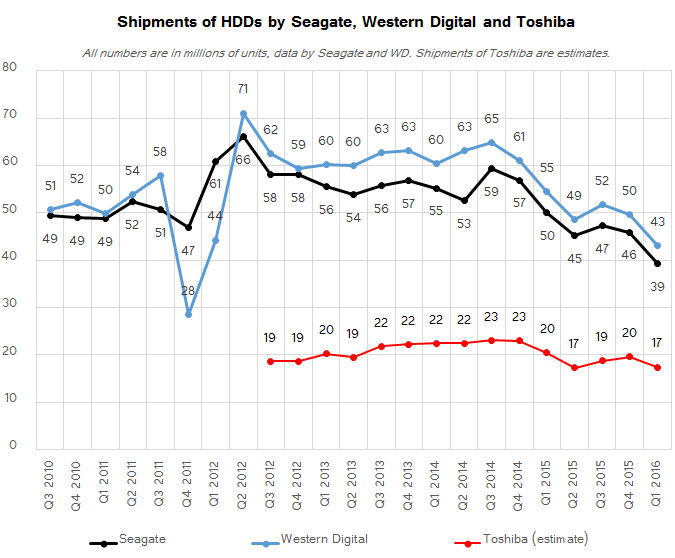 In the same quarter of last year, Seagate, Toshiba and Western Digital sold 125 million HDDs, whereas just six years ago the industry shipped 163 million units. In fact, even in Q1 2006, sales of HDDs totaled 101.7 million units, according to iSuppli (via EDN), which means that we might be talking about a 10-year low in hard drives shipments. Sales of PCs in general (and hard drives in particular) are seasonally not strong in the first quarter of the year, which is why it is not surprising that they declined to around 100 million units from 115 million units in Q4 2015. What is alarming is that despite this seasonal change, Q1 2015 shipments of HDDs were higher than sales of hard drives in each of the remaining quarters last year. If this year follows the same negative pattern, then HDD shipments will be below 100 million units in the second quarter and will remain below that level in the second half of the year. Western Digital estimates that total available market (TAM) of HDDs will decline to 95 million units in the second quarter, which means a decline of around 15% from the same period last year. A moderately good news is that Western Digital seems to be optimistic about the second half and believes that HDD TAM will remain above 400 million units mark in 2016 (compared to 456 million units in 2015), which means that shipments of hard drives will grow in calendar Q3 and calendar Q4. IDC has asserted that inventory reductions, cautious buying and other additional elements of the equation that directly affected makers of components in the recent quarters are wrapping up, Western Digital’s optimism could well be justified. I have enough space to not buy a hard disk drive the next 2-3 years. I think I bought my last HDD 2 years ago. Probably this is the case with most people and with SSDs taking the place of boot drives, HDD companies are losing the low capacity market. For most people who build new systems, they wouldn't know what to do with all that space a 240GB SSD will offer them. No second HDD for them, not to mention that a 128GB USB flash drive sometimes will do the trick, if they need to clean up some space from their SSD, without having to call the technician to install the HDD. On the other hand, people who need space will go for one 4TB or bigger drive, probably external, instead of buying more HDDs with lower capacities to put into their PC case. This. Last year I built about 30 desktop computers for typical home users (i.e., office/light productivity, HTPC, and gaming rigs) - three had a spinning hard drive in them. The average user is usually fine with a 250ish GB SSD, and if they run short on room, I tell them to buy a pair of 64GB USB flash drives for $20-30 total. The thing is, even if some small percentage do wind up needing more storage (unlikely), many routers these days do actually offer a USB port for attaching and providing access to a HDD. That means even if they have multiple computers or devices, they don't need more than one large capacity HDD for a single household. Heck, you can get a 4TB Seagate external 2.5" hdd (actually twin 2TB's with a USB -> SATA RAID) for $150 at the local Walmart. The net result in the massive increase in HDD storage capacity along with the rise of the medium capacity (250-500GB) SSD means that your average household has gone from multiple HDDs in their laptops/computers to a single central HDD. Yeah, I have to agree with you Gigaplex. I consider my library to be pretty generous. I probably have something like ~500 movies and maybe 30-40 TV series (granted most are just 1-2 seasons, but some are 5-8), plus some music and pictures (and not JPEGs, but a LOT of RAW images since I am a photographer, even if not a professional). Currently on my 6TB array (5.4TiB formatted) I have 2.86TiB free. I still have some older SD content (or there IS no HD version) where I only have the DVD that I ripped and a lot of my BR collection I only ripped at 720p, but right now I am at about 10% 1080p, 50% 720p and 40% 480p content. I wouldn't consider that a small collection, but I don't need anything like 30 terabytes of storage. Maybe if my entire collection was BDMVs instead of transcoded down files. There gets to be a point though where that is kind of ridiculous to do and is absolutely not "common". Hell, I probably represent 1% of computer users as it is, the ones who have all of their DVDs and BRs in unreduced files are probably 1% of the 1%. At my rate of growth, I've figured I have about 3-4 more years before I need to worry about storage at all (I don't like having less than ~20% free capacity, or about 1TiB free in this case) and maybe somewhat longer as I do occasionally cull my collection when I realize I haven't watched a movie or something since I bought it years ago, so it gets wiped and I either donate the BR/DVD or I'll just stuff it in a box and forget about it. My collection growth is still positive though, but we are talking maybe 20-40GiB a month (buy a few BRs a month, pictures I've taken, etc. ), maybe .5TiB a year. I doubt it'll happen, but some of me hopes that TLC/3D NAND SSDs are cheap enough by the time I am hitting my self imposed limits just to replace spinning disks in my desktop and server (data is mirrored between them and on 2x3TB RAID0 arrays, plus an external 5TB USB3 disk as a 3rd copy). Probably still too expensive, but I can hope the prices are lower enough and I have the budget to pony up $500-700 to replace the disks in both machines with SSDs (hoping and figuring maybe in 4 years the price of cheap SSDs has dropped under 5 cents per GB). Even if SSD storage is <20%, the beauty there is they are so much faster, no worries about arrays and I can just create a storage pool and add SSDs to it as capacity starts hitting <10% free. Oh yeah, RAW images...I wasn't even thinking about that. If you're any kind of remotely serious photographer you'd need gigantic piles of storage too.